This adorable bunny-eared beanie was created by Juni from Hej Juni. A fall accessory that's sure to stand out from the crowd. Materials: confetti, needle and thread, a paint brush, mod podge, a beanie, fabric that matches your beanie as closely as possible, scissors, pen, and thin wire. 1. Place one piece of fabric over the other, flip side up. Pin in place. 2. Draw bunny ears onto one side. 3. Following the lines you’ve drawn, do a whip stitch through both pieces of fabric. Leave a gap at the bottom. 4. Cut around the bunny ears, outside of your stitches. Don’t worry if it’s messy, this will be hidden in a bit. 5. Pull bunny ears right side out through the gap. 6. Paint the front of the bunny ears with a layer of mod podge. 7. Sprinkle the mod podge with confetti. Shake gently to remove any excess and let dry. 8. Apply another layer of mod podge generously. It’s best to dab on this layer in blobs. Allow to dry. 9. While waiting for the mod podge to dry, bend a piece of wire into bunny ears. 10. Insert the wire into the ears through the gap. 11. Sew the base of the bunny ears onto the top of your beanie. Wilma from By Wilma created this snazzy planters in a just a few easy steps. Supplies: terracotta planters, two sponge brushes (one to be used for paint, one for mod podge), white acrylic paint, mod podge matte finish, gold (or colorful) confetti. 1. Give your planters three layers of white paint. Brush the first one onto the planters, stamp the second one, and brush the last one. This way you will get a nice, kind of rough, structure on your planters. 2. Brush mod podge on the bottom half of the planters. 3. Sprinkle confetti on top of the Mod Podge. Press it onto the planters with your fingers so it stick. 4. Finish with a layer of mod podge on top. Through the way it dries, the matte finish Mod Podge will make the gold confetti look a little like gold leaf. All set! Way to cheer up your desk plants. Wrap a gift in a plane solid paper, then wrap with cellophane, leaving one end up. 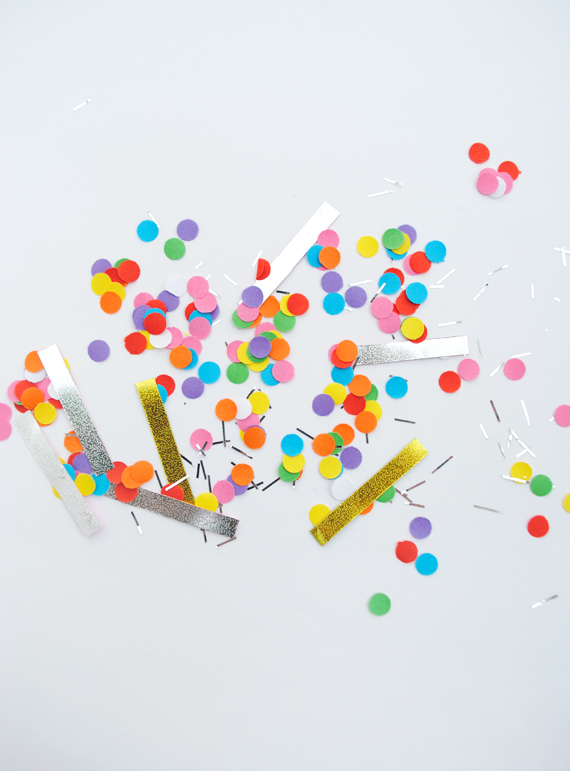 Slide in some confetti (you can just hole punch colorful paper and cut up tinsel), seal it up, and shake! Check out this tutorial. Fill balloons with confetti before blowing them up for floating confetti that never hits the ground. Get the details here. Coat the bottom of a balloon with decoupage glue or Mod Podge, then sprinkle with confetti, as shown here. This blogger decorated plain glass candle votives by rolling them in colorful metallic confetti. This tutorial shows you how to use a hole punch to create over-sized tissue paper confetti, then adhere them to a paper lantern with mod podge. Since tissue paper comes in every color imaginable, you can match any party theme. Cut circles from an array of colorful and textured papers and adhere them to the wall using Blu-Tack. You can use them as decorations for a special event or leave them up! Check out these directions. Create a glue shape on a card, then sprinkle with confetti. Great for Valentines or any other holiday. Here are some tips. Adhere giant wall confetti to sturdy fishing lines using the glue dots they come with. You can fold up each line and store in an envelope for future use or to gift as a gift. Get the details here. Make a chandelier by hanging large confetti from super-fine twine and wooden dowels. Great for an outdoor party or indoor decoration. Check out this post for instructions. Add some pizzazz to a plane old bobby pin with bright confetti, available here. Use a little glue pen to attach individual confetti to easter eggs, as done by this blogger. Talk about party wear. Accent your accessories with some shimmery confetti, as done here. This blogger figured out how to create a confetti-killed card with a plastic bag. Coat a plain wooden mirror with a thick layer of confetti- it'll put you in a good mood even on a bad hair day. Check out these directions. Conceal a gift by sticking it in a confetti-filled jar, as done here. Fill handmade soap with hand-cut confetti for a fun addition to your bathroom decor. Get the details here. Cover the end of a balloon with Mod Podge and confetti, allow to dry, pop the balloon, and trim the edges for a super colorful centerpiece. This tutorial has all the info. Make shimmery pumpkins like these by gluing large reflective confetti around the tops of pumpkins. Make your own version of this tape by gluing colorful hole punches on top of masking. So fun for decorating gifts, envelopes, whatever. Cover a simple foam wreath with loads of confetti, like this blogger did. Cut tissue paper confetti in a range of sizes, and coat a paper mache cone, and make the birthday girl or boy wear it. Here are some tips. Sandwich confetti between two layers of sticky back plastic, scrunch into a bow, and use it as a fabulous gift decoration. This tutorial shows you how. Glue confetti to very thing wire in a cascading pattern, then attach to an earring base. Follow these step-by-step directions. Glue reflective confetti to a canvas in a cascading pattern, like this blogger did.